Coco Ferguson first saw the potential in logistics real estate in East Africa, where as a co-founder of Nairobi-based Maris Limited, she raised USD 60 million to fund the development of Kenya’s first “Grade A” warehouses. Now she wants to replicate that success with Iran Warehouse, a company she founded alongside Nader Sianaki, whose family developed some of Iran’s first modern warehousing seventy-five years ago. The logistics industry in Iran is burgeoning. International players such as DHL Freight and Kuehne + Nagel are connecting the Iranian market to the world by land, while Maersk Line and MSC create new links by sea, facilitating the significant increase in the variety of foreign goods available in Iran since the lifting of international sanctions in January of 2016. The rise of e-commerce has also led to significantly more demand for timely and reliable logistics and distribution services. Despite these new entrants, Iran’s logistics real estate remains greatly underdeveloped. The World Bank began ranking global logistics infrastructure in 2007 with the Logistics Performance Index. The index looks at five factors: timeliness, customs, infrastructure, international shipments, competence, and tracking. The world’s top ranked country is Germany. Iran ranks 96. 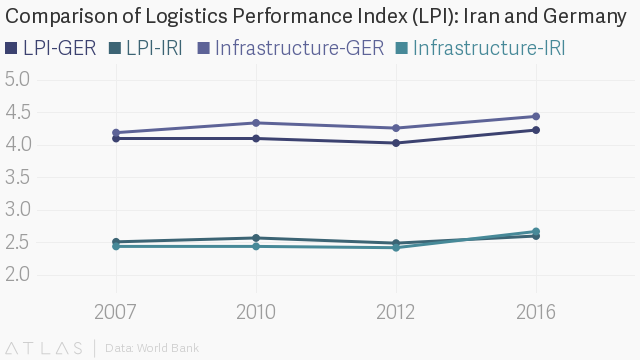 Though infrastructure is one of Iran’s stronger categories, its score of 2.67 is significantly below Germany’s score of 4.44. A lack of warehousing is one major reason for the shortfall. The company has raised 80 percent of an initial EUR 10 million funding round from a combination of European investors and Iranian banks in order to develop Iran’s first true Grade A warehouse park—a 60,000 square meter development in West Tehran, located near the junction between the Azadegan Expressway and Fath Highway. The company currently operates a 6,200 square meter facility in Shurabad. Further sites are under planning. Iran Warehouse is entering a sector characterized by fragmentation and inefficiency. Nearly all warehouses in Iran are owner-occupied, bucking the international norm. Manufacturers and logistics firms around the world typically seek to avoid the cost and hassle of owning their own warehouses, opting instead to lease space from logistics real estate firms. The world-leading logistics real estate company is San Francisco-based Prologis, which oversees a portfolio assets worth USD 79 billion. The Chairman and CEO of Prologis is Iranian-born Hamid Moghadam. One of Europe’s largest logistics real estate companies with 630 properties, Logicor, is also led by an Iranian, Mo Barzegar. But in Iran itself, commercial enterprises treat real estate assets as a hedge against volatility and risk. Banks have also been historically reluctant to provide loans to enterprises without real estate collateral. The incentives for companies to own their own warehouses are clear. Owning real estate does not however mean that Iranian logistics companies value it. A 2018 study by researchers at the Iran University of Science and Technology surveyed 119 Iranian logistics providers, who were asked to rank key success factors in their industry from one to five, with five being the most important. Just ten respondents gave “fixed assets” which includes warehousing facilities, the highest score of five, while 47 respondents scored fixed assets at one. It is fair to assume that logistics providers have a limited appreciation of the additional costs and lost efficiencies represented by the current configuration of logistics real estate in Iran. Even Iran’s largest companies often make do with numerous small warehouses, which requires them to take-on additional staff and equipment for each site. Ferguson believes that companies in Iran are paying a 30 percent premium on overhead because of such configurations. Add to this the additional costs of inventory management and distribution from multiple centers, and overall logistics costs are probably 60 percent higher than would be the case for a company with access to a well-located and professionally-managed warehouse. The additional cost is passed onto the consumer, creating wider economic consequences. For Iran Warehouse, these high costs present a unique opportunity. Ferguson acknowledges that Iranian companies have ingrained habits, but cites early success in demonstrating to potential clients how upgraded logistics infrastructure and professional third-party management can unlock value. The company has partnered with Niktak Freight Forwarders and Shipping, the Geodis agent in Iran, to provide distribution services in addition to the operation of its warehouses. Turn-key solutions have seen Iran Warehouse win 5-7 year leases from clients, rather than the one-year leases that have been commonplace in the warehousing market. For investors, warehouses may not seem like the most appealing assets, but Ferguson thinks those looking at Iran often overthink their strategies. “Iran is seen as a high risk market, and so investors naturally gravitate towards high-risk, high-reward businesses,” she notes. “Investors tend to ignore the very low risk opportunities in an area such as warehousing.” Warehouses, unlike other forms of real estate, can be built in phases as clients are found, limiting the risk to upfront capital. While Ferguson expects to generate conservative returns of 15-18 percent for her investors, she notes that Iran Warehouse’s revenues are tied to contracts indexed to the Euro, eliminating exposure to volatility in foreign exchange. Given that Iran’s currency has lost over 30 percent of its value over the last year, an insulated 15 percent return is inherently attractive. By focusing on the storage and handling of food and finished goods, rather than industrial products, Iran Warehouse will enjoy consistent demand however the political tides may turn. The anchor tenant for the company's new facility is global food and beverage giant Nestle, which has been operating in Iran through its local subsidiary for 15 years. Moreover, as zoning in Tehran is changed to reduce congestion, many smaller warehouses located in what are now centrally-located neighborhoods are being converted to residential or retail developments. Tehran Municipality therefore has an interest in seeing consolidation in logistics real estate. Newly constructed warehouses will often be situated in Tehran’s traditionally blue-collar outskirts, which have seen factories relocate further afield, to places like Qazvin. These new facilities will bring much-needed jobs. Iran Warehouse’s Azadegan site will create 250 jobs when fully developed.